The iBall CompBook Netizen - ACPC laptop comes with an HDD/SSD support of up to 2TB, and a 5000mAh battery. iBall has launched the ‘iBall CompBook Netizen – ACPC’ laptop for Rs 19,999. The company claims that this is India's first laptop with 4G LTE connectivity, and has HDD/SSD support of up to 2TB. The laptop comes with a 5000 mAh Li-Polymer battery. Available in Metallic Grey colour, the product is exclusively available with Shopclues.com. 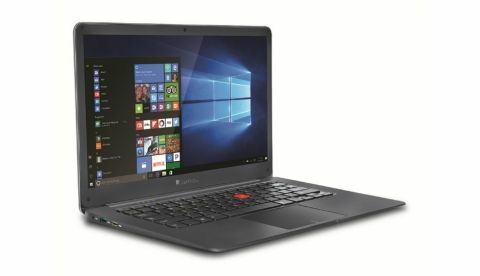 iBall brings another extension to its first timer products in India with Built-in 4G LTE connectivity ‘iBall CompBook Netizen – ACPC’ to carry out the business and professional chores effortlessly. iBall CompBook Netizen sports a 14-inch FHD IPS multi-touch display with 1920x1018 pixel resolution, and is powered by an Intel N3350 dual-core processor with processing speed of upto 2.4GHz and 4GB DDR3 RAM. Enabling smooth multi-tasking and productivity, it has the inbuilt storage upto 64GB, which is further expandable with MicroSD Card upto 128GB and an a separate 7mm expansion slot that can be used for installing a hard disk or SSD. Compbook houses a 4G SIM card slot along with 5000mAh battery supporting longer hours of working with faster operation. The iBall CompBook Netizen runs on Windows 10 and comes with several connectivity options which include LAN, Bluetooth 4.0, and Wi-Fi in addition to being 4G capable. The laptop also has USB 3.0 port, HDMI port and two USB 2.0 ports. Available in the shade of Metallic Grey, the product is exclusively available with Shopclues.com. How to open the boot menu option of iball compbook excelance?